New Hatters loan signing Joe Pigott admitted the chance to play for Luton boss Nathan Jones once more was just too good to turn down. The Charlton Athletic striker, who came through the ranks at the Valley, has first hand experience of Jones’ coaching methods when he was the Addicks’ U21 boss. 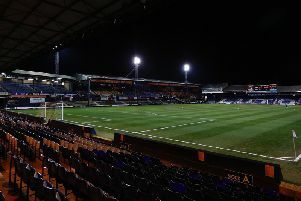 Now in charge at Kenilworth Road, Pigott was one of the first players Jones wanted to bring in and the 22-year-old was only more than happy to join. He said: “I was really interested, because I’ve worked with the gaffer before and I think he’s a really, really good coach. “He’s developed me a lot before and hopefully he can do that again. “I had quite a few options so it was just weighing them up, but working with him again was too big of an opportunity to turn down. “There were a couple of other sides interested, but I’m just happy to be working with him again and being at Luton Town. “No manager can guarantee you playing time but I just feel he can help me in my game to become a better player. “I’ve seen what he’s been a part of and what he’s produced. Pigott has spent this season at Southend, where he had an impressive loan spell last term, scoring seven goals, including the Shrimpers’ last-gasp play-off final leveller against Wycombe. He found things harder going this time around, finding the net only five times in 28 appearances, so was looking to go out again if he couldn’t get first team action with the Addicks. Pigott continued: “I was trying to get an opportunity at Charlton but it never really happened, so as the window drew to a close, I was looking to get some games. “Luton are a big club, it goes without saying, they have the second highest crowds in League Two.